Sometime in late 1676 Edmund Halley left Oxford and set sail for St. Helena, an island in the south Pacific. There he hoped to accomplish two projects. First, he wanted to compile a catalog the stars in the southern sky, which would complement John Flamsteed’s catalog of norther stars. Second, Halley wanted to observe the transit of Mercury, which would occur the following year, so that he could calculate the distance between the earth and the sun. Thanks to the support of King Charles II, who wrote a letter to the East India Company asking them to take Halley to St. Helena, Halley sailed south and arrived on St. Helena around March, 1677. He set up his instruments and spent the rest of the year observing the heavens, cataloging 341 stars in the process. In 1678 shortly after he returned to England, he published his star catalog, Catalogus stellar australium . 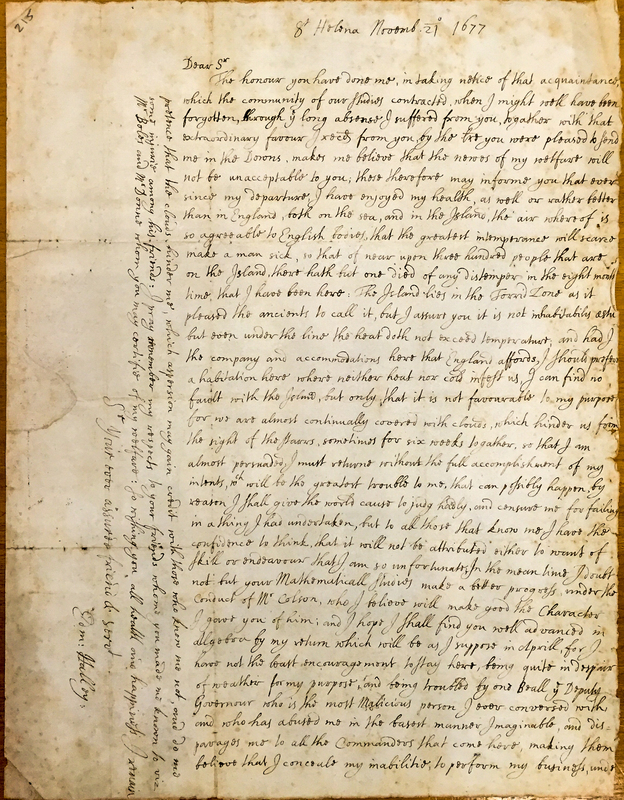 A letter Halley wrote in late November 1677 while still on St. Helena is fascinating for what it suggests about his time on the island and the personal conflicts that threatened his reputation. He found life on the island pleasant and boasted that the “air was so agreeable to English bodies” that scarcely anybody could get sick. Far from being uninhabitable, as the ancients had supposed islands in the torrid zone would be, he found the climate more pleasing than England’s. He did, however, complain about the frequent cloud cover that prevented him from carrying out his observations. Although he doesn’t mention it in this letter, just a couple weeks earlier he was lucky enough to have clear skies when he observed the transit of Mercury. Halley also complained about the Deputy Governor, a Mr. Beall. The two did not seem to get along. According to Halley, Mr. Beall was “the most Malicious person” he had met and had “abused [him] in the basest manner imaginable.” Mr. Beall disparaged Halley to commanders and other people on the island. Here is a full transcription. A letter written by Edmund Halley on November 21, 1677, to a correspondent in England. Halley praised the weather, bemoaned the frequent cloud cover, and complained about the abuse heaped on him by the Deputy Governor. From the “Charles Roberts Autograph Letters Collection,” Haverford’s Quaker and Special Collections, call #215. See the finding aid. At one point Halley seems to paraphrase book one of Ovid’s Metamorphoses , on the origin of the earth. There Ovid says the torrid zone is not inhabitable because of the excessive heat, “Quarum quae media est, non est habitabilis aestu.” Halley rephrases it, saying “The Island lies in the Torrid Zone as it pleased the ancients to call it, but I assure you it is not _inhabitabilis estu_….” It is unclear whether or not Halley knew this quotation directly from Ovid or if he knew of it through some other text, e.g., Sacrobosco’s De sphaera . By the 13th century Sacrobosco’s text included these lines from Ovid. The quotation became a standard feature of Sacrobosco’s text in the print tradition. See, for example, the late 15th-century edition printed in Venice or the late 16th-century edition also printed in Venice. 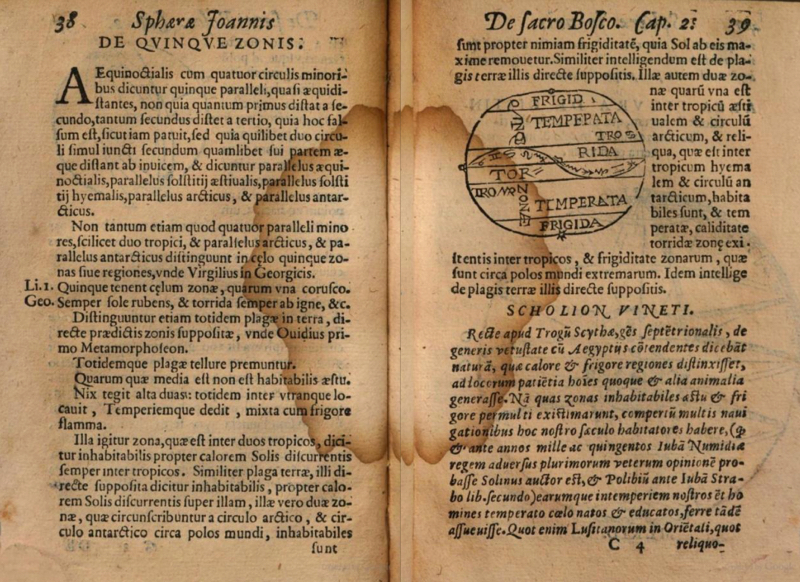 A late 16th-century edition of Sacrobosco’s De sphaera quotes Ovid on the uninhabitability of the torrid zone. Sacrobosco De sphaera (Venice, 1586), 38. Whatever Halley’s source, it seems odd that in the late 17th century anybody still bothered to mention the ancient worry that the torrid zone was uninhabitable.